A Sunday in February with nothing on the calendar (a rare event in our household)…and it’s Valentine’s Day!! Instead of just relaxing, I decided we needed a plan. My daughter recently made homemade soft pretzels in her high school baking class and has asked to make them at home. Jesse’s family also has a tradition of making soft pretzels and we haven’t done so in a long time. We decided to tackle the pretzel project, but with a twist. We wanted to compare the recipe from school with the one used by Jesse’s family. The recipe used in school is by Alton Brown from the Food Network (Homemade Soft Pretzel Recipe) and uses homemade bread dough. Thaw bread dough and cut each loaf into 20 pieces. With hands, roll each piece on a very lightly floured surface until it is 12-14 inches long. To shape pretzel: Cross hands at wrists, one hand over the other. Pick up the opposite ends of rolled out piece of dough. Uncross hands. Re-cross hands with other hands ending up on top. Let pretzels rest for about 5 minutes. Prepare lye bath: One gallon water and two tablespoons of Lewis Lye. Heat lye bath to boiling. Drop pretzels, one by one, into boiling lye bath. When pretzel floats, remove it from bath with slotted spoon. 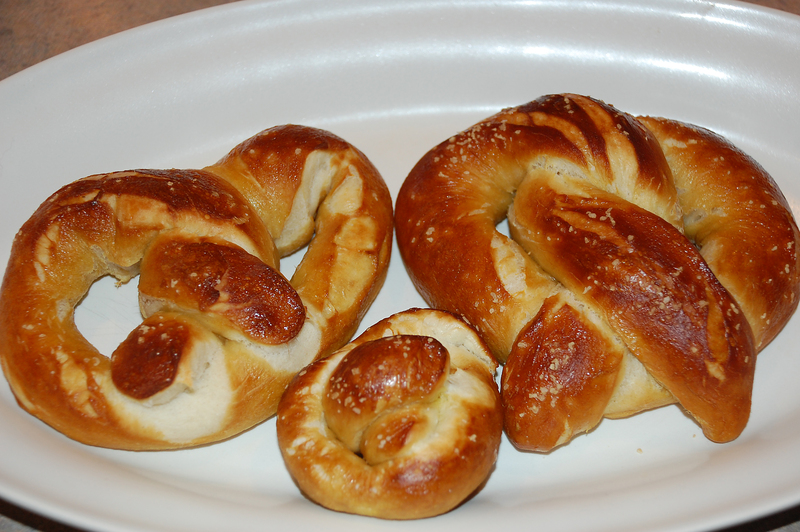 Place pretzel on plate and sprinkle with coarse salt. Place pretzels on greased baking sheet. Bake at 400 degrees until brown, about 10 minutes. We started out with both the frozen bread dough (thawed out) and a batch of the home-made bread dough we prepared from Alton Brown’s recipe. The next step was to decide what type of water bath we would use for the pretzels. Jesse’s family recipe calls for a lye bath. Really? Where do you even buy lye? And is it really safe to eat something that has been submersed in lye? I guess Jesse is living proof that you can survive eating soft pretzels cooked in a lye bath, but we nonetheless opted to go with the baking soda water bath used in Alton Brown’s recipe. We also egg-washed the pretzels after removing them from the soda water bath and before sprinkling them with salt. The other main variation in the recipes was simply in the size of the pretzel. Jesse’s family recipe called for dividing each loaf into 20 pieces to roll out the pretzel, which made much smaller pretzels than the Alton Brown recipe. Mastering the technique of shaping the pretzels was challenging and some of the creations quite humorous. I’m sorry to say that my attempts at food photography were pathetic and I only ended up with one picture even close to being worthy of sharing. The hot pretzels right out of the oven, smothered with cream cheese, were a big hit with the kids. And the results of the recipe comparison? The home-made soft pretzels had a slight edge over the frozen bread dough technique. Very true. Lessons to be learned there… 🙂 I do wonder though how different the pretzels would turn out.